When most of the chandeliers and sconces were installed last week, I got a big thrill. They've been boxed up for far too long, so seeing them all lit up is a big deal. Especially in the master closet where a small crystal chandelier and seven brass picture lights from Pottery Barn illuminate my favorite room in the house! Also from Pottery Barn, a crystal chandelier for the master bedroom. In the living room, I had the electrician wire the cathedral ceiling for a chandelier. I chose this large, airy French style light from Wisteria. Also in the living room and dining room, there are these sconces, eight altogether from Aiden Grey. I topped them with a burlap shade to give them more ooomph. For 15 months, this chandelier has been packed away. I insisted on taking it from the old house. Unfortunately, it's too big for the new dining room. 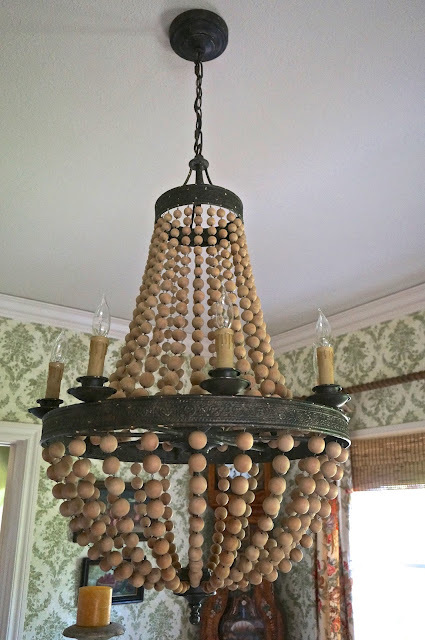 Ugh, I planned my whole house around this chandelier! Downstairs, in the family room, I found these sconces from Rejuvenation. Instead of cans, I installed these hanging pendents from Restoration Hardware. They tie in with the family room sconces and add warm light to this awkward space. Last, but not least, I found these nautical brass lights for the atrium. They're from Pottery Barn and they resemble a ship's porthole. I love them, even though they don't exactly match the outside lights around the front and side of the house. Things are moving along quite fast now. We should be moved in by mid January. We better be, because I gave my 30 day notice! I am dying for your lighting, every single piece is picture perfect for your new home. You have to be beside yourself with excitement!! Yay, moving day just around the corner!! I am so happy for you and Gary!! You have made some wonderful choices with the lighting! Can't wait for you to get all moved in! Oh I love it all, especially the front entrance. Just beautiful. Hope we get a whole house tour one day soon. Fun, fun, fun! Even partially finished, everything looks so clean and light! Can't wait to see it when you're in it! Merry Christmas and Happy New Year! What gorgeous lighting you chose! Can't wait to see more of your lovely home! Hmmmmm --I think I would find a place for that light from your last house -- don't believe I would be letting that one go. But that's just me. I love the exterior of your house in that last shot. This looks like such a wonderful "retirement" or "empty nester" place. I know this is about lighting, but you had me at grass cloth! More on that please. It makes my head spin at how many decisions you have made in such short time. You have great talent! Stunning collection of lights, your new house is already looking fabulous. Bonne année 2016, wishing you a very happy, healthy and prosperous one. Darling, your selections r wonderful! Throw traditional expectations out the window when decorating. We r not bound to anything. Mixing up ur lighting adds much more character and creates an interesting environment for ur home. If you love something, use it..... because it will make ur heart happy, and that my love,......is what life is all about! I just discovered your blog this morning and have had great fun browsing through many of your posts. I plan on building a new home this year and you've got so many great ideas! Happy New Year! Can NOT wait to see the whole house when you finally move in! It's just around the corner now! !